Lena, Invader 22, Sailing Lena, First all day trip, Singlehanded in the Bristol Channel. Around the Bay - 3rd singlehanded sail in Lena. 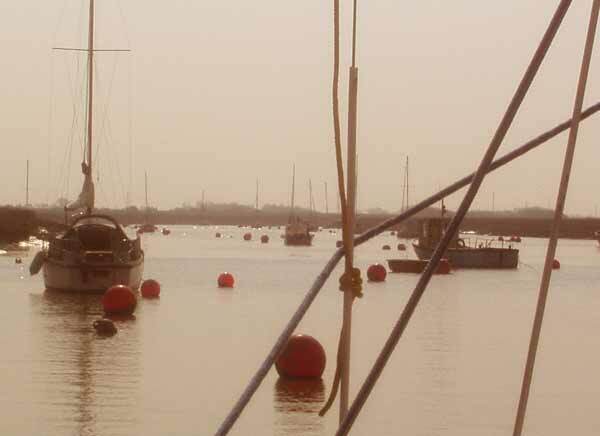 After all day out yesterday - and then staying aboard on the mooring, I suspected I might not be wanting to get out there at 8.30, just for a few hours on the tide. The light would have been really tight with HW at about 11 pm - can only get onto the mooring at 2 and a half before - I could have got up the Axe at 8.15 pm, just enough water, just enough light - then moor her up in the dark ! Anyway - I was raring to go again. For the first time I felt easy and relaxed about going out. Thats a little hill to get over. She floated free about 8.30 am - by the time I finished my coffee and cig it was 8.50, and I was gliding down the river. Still beautiful balmy weather for a British Easter ! A bit more breeze - but none to speak of. Occasionally enough to kick her in gear, so just spent a while around the bay tacking her around on my own. Also, being Easter Sunday and 10.30 HW there were a few local boats coming out - so I had a few other things to concentrate on ! 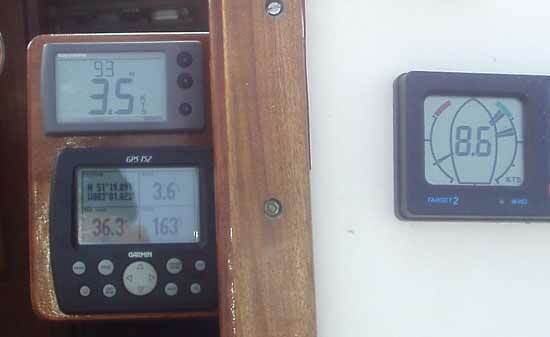 Took this pic of the instruments - 8.6 kts apparent on a fairly close haul - and 3.5 kts on the Raynarine log, no help from any tide - thats getting 3.5 kts into about 6 kts of wind - not bad at all. These two days have just been ideal for getting the boat sorted. I've been able to fiddle about on deck underway - and have sorted an easy arrangement for a pair of boom preventers - a real bonus on your own in light winds. Ideally, I think she needs a big light genoa for light airs. The roller genoa is about 135% and quite high cut - its great in that you don't need to reef it too much - we had it full out all the way over to Barry last year in up to thirty knts, so you keep a good shape. I've got the removeable forestay, so can easily use a hanked sail - I'm keeping a look out. With crew - I would have ago with the cruising chute, but a while before I try that on my own ! Nice pic here of coming in to the Axe, late yesterday. Stayed aboard again on the mooring - checked out the rig tensions and tightened everything up a bit after the winter gales and all - rewired up all the rig screws. Scrubbed up a section of coachroof. Wind really got up a bit in the afternoon - for the first time in a few days. Really have to sort out a bit of the rigging - my delta plates need re-newing really. They were made from some A2 stainless - very beefy, but they are pickng up surface rust which is running and staining the rigging below a bit. Also, the backstay bridles and the main shrouds are close to the limit of adjustment. I can sort the mains by putting a Norseman on the end in place of the swage eye - the two 7/19 bridles I'm having made up new, as one has a flaw in the wire anyway - and new delta plates - when I can get a sensible price for them - or I can find a source of 6mm A4 stainless plate, or decent bronze 6mm plate. Hard to get it would seem. About six miles - not that it mattered much. A somewhat more successful attempt in getting her on to the mooring.